Crystallized mainly as prisms, sometimes strongly extended and different the vertical shading. Rarer there are flatten crystals as thin плиточек. Separate crystals are exceptionally rare, they almost always accrete, forming needle-shaped, fibred, fissile or scaly aggregates. Dense massive accumulations, branchy and stalactite, are most widespread, with radiant or earthy addition. Colors darkly-grey and brown at crystals, light-red or yellow-brown and ochreous-yellow, gold at earthy varieties. Chemical composition (chemistry, compound). 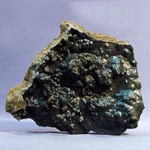 Oxide of iron (Fe2О3) 89,9%, water (N2o) 10,1%. Form of crystals. Prismatic, needle. Class of symmetry. Rhombo-bipyramidal group- mmm. Relation of axes. 0,464 : 1 : 0,303. Cleavage. good on (010). Aggregates. Dense, grainy, radiant, fibred. 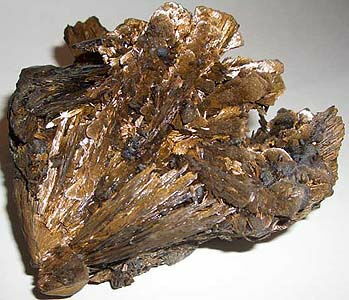 Goethite is a black, brown, or yellow mineral consisting of hydrated iron oxide in the form of orthorhombic crystals or fibrous masses (iron ore). Formula: FeO(OH). Powder, placed in a glass test kimberlite tube, at heating flame becomes reddish and transformed in an anhydroferrite, selecting water. Fuse melt, in the closed glass kimberlite tube at heating loses crystallizational water. 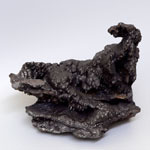 Above all things a goethite is an oxidate other minerals of iron, such as a Pyrite, Magnetite and siderite. It often appears in hydrothermal terms as beautiful radiant groups of crystals into quartz geodes. 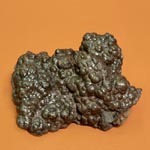 A goethite makes considerable part of limonite formations (a common brown, black, or yellow amorphous secondary mineral that consists of hydrated ferric oxides and is a source of iron. Formula: FeO(OH)*nH2O), entering in the complement of the so-called "yellow ochre". In Italy is in the great number of places. Among them old developments of iron-stones are in Brosso and Traverselle (an area P'emont), in Монте-кастелло, Vichentino, Rio-Marina, on El'be. 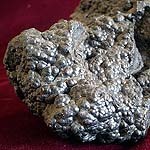 Goethite - one of the best ores on iron. 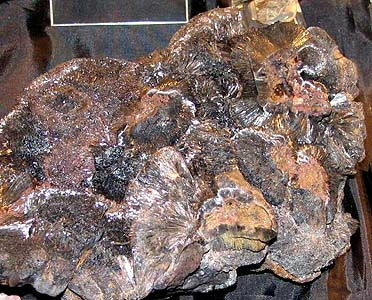 Goethite. Volodarsk-volynskiy, Ukraine (CIS). 9 sm. A photo: © V.A. Sletov. 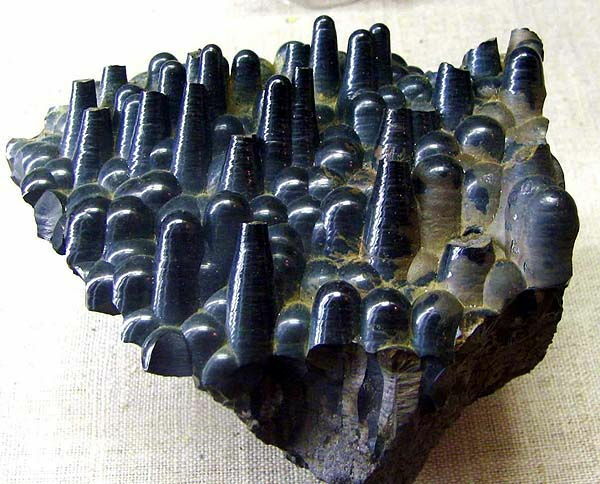 Goethite. Bakal, Yuzhn. Ural, Russia (CIS). Mins museum the name of A.E. Fersmane. A photo: © A.A. Evseev.